Snow is back on the ground, but that doesn't mean it isn't spring! April's Pink Moon - also known as the Egg Moon, the Sprouting Grass Moon, and the Fish Moon - is already waning. The end of the school year is doing that funny thing where it ramps up and up and up. It's as if we are ascending to the highest height of the roller coaster, just before we plummet so very suddenly to the end. The view from up here is glorious! My YES Tuesdays start with 4th grade before school writing club. A devoted group of writers comes in early for writing prompts, literary games, and a chance to sit down at the venerable typewriter! Each week, I'm in a second grade room for a full hour of art and writing. I visit all third grade rooms with new "Challenge by Choice" activities weekly and work with a few third graders on the side. 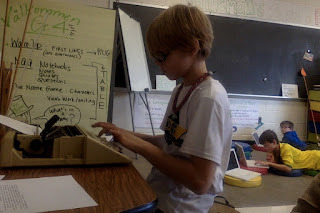 Fourth grade features a Communications group, a recess science club, as well as a small poetry group. The day flies! 5th Grade groups have been pursuing their own writing, punctuated (and perhaps galvanized?) by group writing prompts. Some of the students have been in charge of the School Haiku Board, with its seasonal display....We've also embarked on a "poetry in unexpected places" mission, in honor of poetry month (although the Poem Booth would argue that EVERY month is poetry month). N.B. When we get frustrated, we allow ourselves to forage in the Shakespearean Insult Kit and to fume aloud - Thou errant knotty-pated knave! A sixth grade literary (and existentialist philosophy) lunch group flourishes. 7th Grade took books destined for the discard pile and turned them into beautiful art with a stated theme. Check out their fanciful work on this Altered Book Blog (produced by students, too). 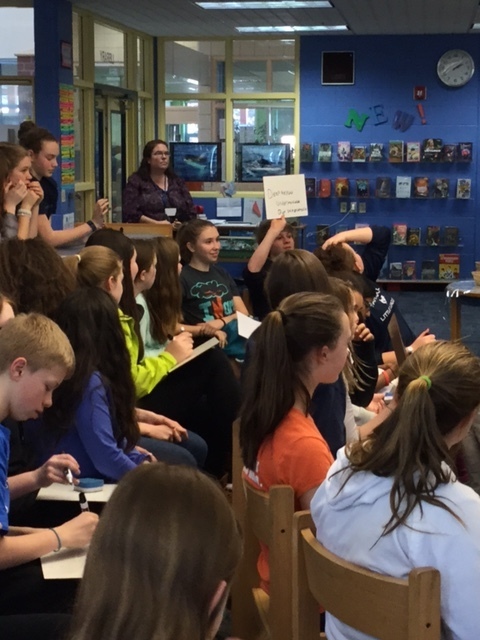 A seventh grade lunch group is devoted to book talks and sharing. 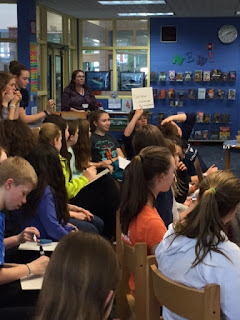 8th Graders have been immersed in (informal) debating. Maybe it's in their general nature. 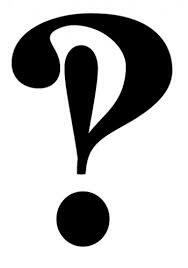 Generally, we begin with a writing prompt, write for 10 - 15 minutes, then take up the topic. For example: Zoos - beneficial or not? We're waltzing around in poetry for a while, riffing on Wallace Stevens and Wislawa Symborska, and will soon embark on readings and activities designed to complement the upcoming Civil Rights Unit. For example, we'll read the powerful wreath of sonnets that is A Wreath for Emmett Till. 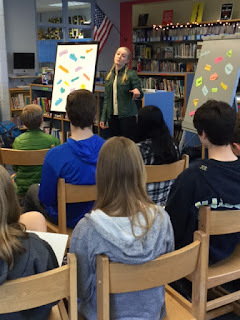 The photo below is from our annual Poetry KaBaam. A KaBaam is a locally invented variation of a poetry slam. After the student reads or performs the poem, audience members hold up signs on which they've written how the poem made them FEEL. A standing room crowd of 7th and 8th graders attended. Here, YHS Poetry Out Loud winner, senior Manny Dettmann, works her magic. 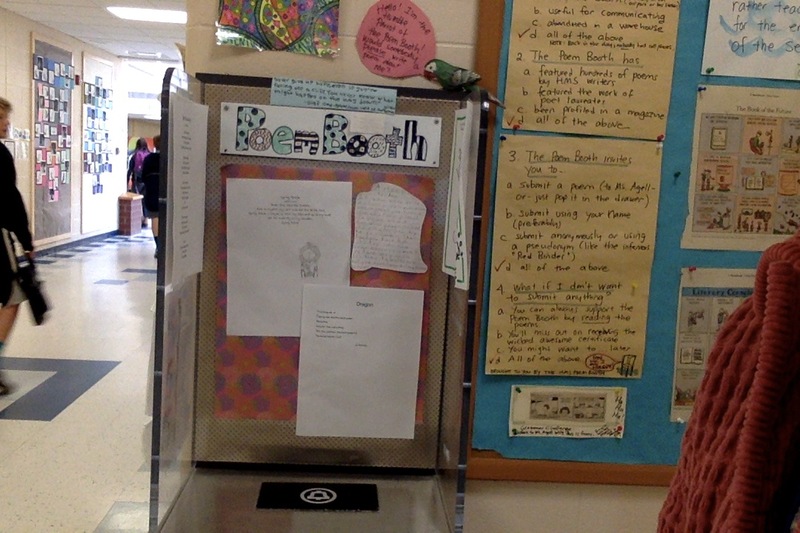 The Poem Booth has had a super busy year...each week sees a backlog of poems awaiting their chance for hallway fame. Someone even finally wrote a poem for the Parrot of the Poem Booth, seen at his perch here. Soon it will be time to publish the 20th Annual issue of Legenda, our NCTE award-winning literary magazine. We received almost 300 entries from 5th through 8th grade students, as well as 28 superb cover submissions. 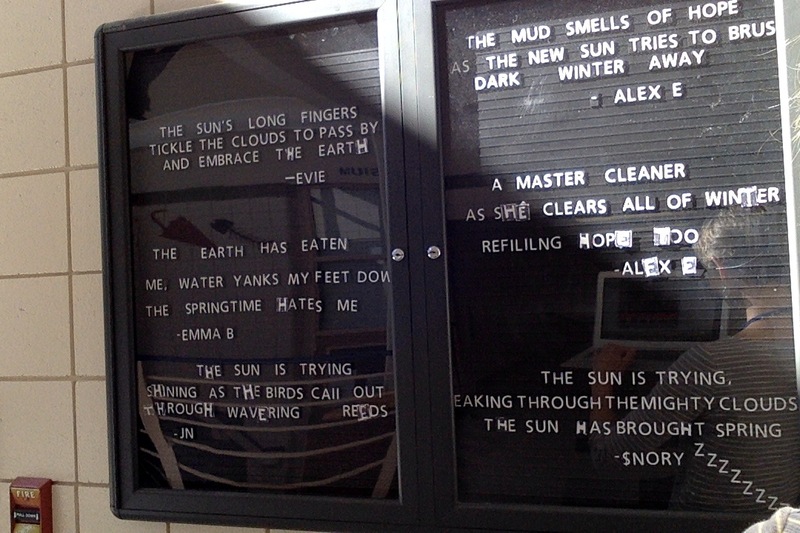 The 8th grade staff has been busy, as each submission has to be read by at least six editors! Along with the many activities and groups that are flourishing, we are getting ready to make enrichment recommendations for next year. What can the GT staff do to help the classroom teachers support the needs of our quickest, deepest thinkers? Options include small groups, 1:1 projects, and helping teachers with differentiated materials for the classroom. Support plans for an individual may vary from year to year, as we seek to serve our grade 2 - 8 population. As always, the GT teachers and the classroom teachers work as a team. The enrichment screening committee includes Bob Gross, Jodi McGuire and me, along with administrators, school guidance counselors, and a classroom teacher from YES and HMS. For more information on our process, please visit our website. You'll see that we are under Instructional Support. Click on GT/Chapter 104. Also, it's not too early to begin thinking about SUMMER opportunities. In our very own backyard, amazing YHS English teacher, Anne Tommaso, will run a Young Author Camp for students entering 9th -12th grade. This camp takes place at Merrill Memorial Library and offers the chance to explore poetry, fiction, and creative nonfiction in a relaxed, supportive, and fun environment both inside and out. They'll also experiment with basic bookbinding techniques to add visual art and dimension to writing. Portland's amazing TELLING ROOM offers multi-age options for those who like to write. If math/science are what you are after, the summer camps at Maine School of Science and Math get high ratings from campers.